Metal detecting in Oklahoma follows the Antiquities Act of 1906. The link below provides an explanation of that law, and some of the problems people face who break it. Be sure and read through that entire page, as well at the links to other pages I have provided. Even though the Antiquities Act does not specifically mention "metal detecting", you need to understand what that law says about digging artifacts. Pay particular attention to the section of stories that have been related to me about what happens when individuals break these laws. Below is a synopsis of another Oklahoma law, the "Archaeological Resources Preservation Act" (ARPA). The state legislature passed this law in 1985 to protect archeological sites on state-owned land. Site excavations on state land must be done by trained researchers who have been issued a permit from the State Archeologist, Oklahoma Archeological Survey, Norman. A provision in the law can help landowners protect their archeological sites against unauthorized relic digging. All artifacts recovered from excavations on state lands must be deposited in an Oklahoma museum or repository. The policy of the State Archeologist. the State Historic Preservation Officer, and the Oklahoma Museum of Natural History is to make archeological materials available to qualified researchers for study and to responsible museums for display. Violators of the provisions of this law are guilty of a misdemeanor and, upon conviction, may be fined up to $500 and/or be imprisoned up to 30 days in the county jail. Passed in 1987, this law extends protection to human remains and associated burial goods in unmarked graves on both state and privately owned land. In essence, it is illegal knowingly to disturb, buy, sell, or barter human skeletal remains or associated items from unmarked graves. Also, these items may not be displayed for profit or in any commercial enterprise. People who encounter or discover unmarked graves and their contents should stop any further disturbance activities and report the find to an appropriate law enforcement officer in the county where the remains are found. Violators of this law may be guilty of either a misdemeanor or a felony. For a misdemeanor conviction, violators may be fined up to $500 and/or be imprisoned up to six months in the county jail. A felony conviction could result in a $1000 fine with up to two years imprisonment in the state penitentiary. To make metal detecting in Oklahoma even more difficult you need to be aware of another law, The National Historic Preservation Act - NHPA. do not dig anything that you believe is an artifact, or anything that is older than ugh 100 years. For metal detecting in Oklahoma, town, village and city parks, you'll need to check with those local officials. Find out what all of the fuss was about. 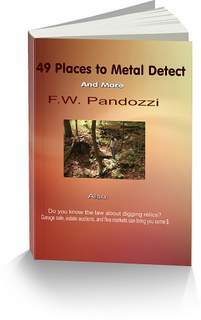 My home page is all about metal detecting in eastern ghost towns. Have you been metal detecting in Oklahoma ghost towns? Remember, be careful, and do not break any of these laws.